Flashy Classic,a classic dog shirt with the head of a bulldog,simple and generous. Any Dogs,this is a popular dog shirt that can be weared by different size dog.It is easy to find a right size whether your dog is a small dog,medium-sized dog or a big dog.Usually dogs within 100 pounds can wear. 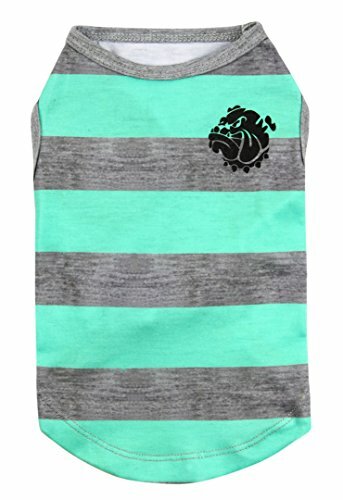 Any Where,blue and gray striped dog t shirt,can also be used as a sports wear,dogs can go anywhere by wearing it. Most Comfortable,one of the best shirts in caring dog's feelings.Dogs will never feel tired after wearing it! The dog shirts is made of 65% cotton and 35% polyester.Its fabric is soft and breathable.Typical summer dog shirt! Classic and Casual Style pet shirt!Usually,It can be worn as a dog's sweatshirt or training clothes.Your dog will feel very freely and happy with our clothes when she or he walking on with you. This shirt has eight different sizes to meet the needs of different dogs breeds.Such as English Bulldog,Dachshund,Poodle,Chihuahua,Shih Tzu,Teddy,Yorkie,Boston Terrier,Corgi,Pomeranian,Fox Terrier, Schnauzer, Golden Retriever, Labrador and so on. Why choose us?First, our quality is the best in the same price.Second, our size is the most accurate，You can easily choose the right size.Third, in addition to quality, we also care about the feelings of dogs.Elastic Belt Inside Belly for Better Fitting.You dog will feel most freely and comfortable. If you have any questions about this product by Puppy Face, contact us by completing and submitting the form below. If you are looking for a specif part number, please include it with your message.